Yeeeehaw! My quilts are going to smell like swine by the end of next week. It’ll be worth it if I win the top prize of 7 bucks. I could almost buy an elephant ear with that on the midway. Here’s what I took in: I entered my only completed queen-size quilt finshed to date: Wedding Stars, aka, Wedding Spectacularrrrr (you’ve really got to roll your “r’s” when you say it though or it just won’t come out right). It was a gift to my sister-in-law and her new husband just over a year ago. Just look at that puckering and stinky hand quilting! On the up side, it does have a four-leaf clover fabric in it that could look like a 4-H logo. I’m hoping to win some of the judges over that way. I am so flattered! Thank you, thank you, thank you, Denyse! Sorry for the bad picture. I tried and that was the best I could get. The top is almost done but I’ve pretty much wiped out the last of my white fabric and will need to get more before I can finish it. I do have a question for the more knowlegable quilters though: Can I technically call this a charm quilt? There’s no two pieces of print fabrics the same in it, despite the white. I didn’t know. The machine piecing is going well though. I’m feeling a lot more comfortable with it now. I’d like to try tackling machine quilting too, but I think I’m going to need to get a walking foot before I hit that. Today’s big project is to add a hanging device to Wedding Spectacularrr (last summer’s quilting drama). I’m taking it to the fair on Friday (to be judged along side of the cows and pigs) and I think it needs to be able to be hung. We’ll see how it goes. I have a feeling that I’m not up to fair standards though–like my friend Steve told me, there’s no way I’ll win since there’s no chickens, sheep or 4-H logos appliqued anywhere (everywhere) on it! County Fair Pride! I’m reconsidering my decision on doing the Eclipse quilt for the Modern Quilt-Along. I just don’t think it’s going to work. Once my book gets here I’m going to rethink the project a bit. Off to have lunch with my birthday husband! 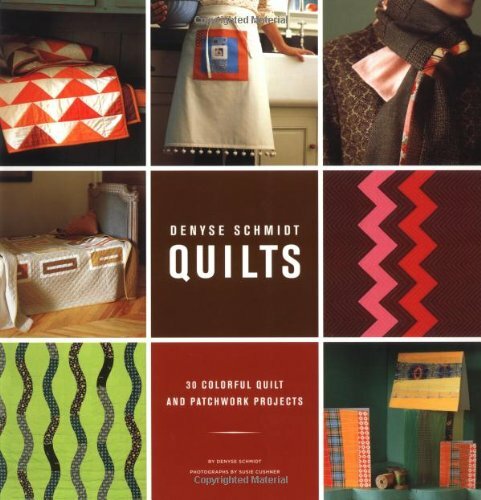 Would anyone be up for doing a Denyse Schmidt quilt-along? I know there’s a lot of people who are really excited about the new Denyse Schmidt Quilts: 30 Colorful Quilt and Patchwork Patterns book (including myself!!) and this could be a great way for all of us to encourage and learn from what we’re all doing. If you’re intimidated by doing a big quilt don’t worry–there’s lots of other small paterns included in the book that you could participate with. I’m thinking that we’ll start sometime after the first week of August. That’ll let people have some time to think about what they’d like to get started with, and pick up a copy of the book (I just ordered mine yesterday!). There’s no deadline and no pressure to finish your projects by a certain date. If you’re interested in joining in, leave a comment or drop me an e-mail! It reminds me of a Monet painting! Just so far, nothing has really made me want to use it yet. I was really moving on it this afternoon, but I had to stop when the sun was reflecting off my sewing machine into my eyes like a blinding laser. That made sewing not as much fun really. But as I’ve been working on this, I’ve been re-thinking my color choices for the Eclipse project. I was feeling really set on the red, pink, orange and yellow combination, but I just don’t think it’s going to work. I think I can probably leave in yellow and maybe pink, but I’m having a lot of trouble finding fabric that would really work for red and orange. I don’t really want to have a pink and yellow quilt either (too girly for my taste). It’s not that I don’t like the colors in the original pattern, it’s just that I’d like to do something different with it. I can’t wait to get my copy! Exciting!